Now I’m off to continue painting. How did you spend your weekend? Oh! It’s opening up the space so much! I see you started to paint around the built in — are you painting the doors/cabinets too? The white works so much better with that gorgeous wallpaper. I think you need to paint the ceiling and above the moulding…. nothing to crazy, but a bit of depth that would emphasize the architecture of the space. So far, I love it! What a complete difference! I can’t wait to see the final outcome. Have you made any head way on the chairs? The room looks great! So light and bright. As for my weekend, I made a tomato corn pie, knit a hat and started knitting a sweater. Work that I enjoy. looks great! i knew it would! Nicole, I think you have made the right decision to paint. I love it!! I know you had been pondering about whether or not to paint out the wood. Are you happy with your decision thus far?? We have Oak kitchen cupboards and they are so out dated, I been contemplating painting them (I know most people think that’s a swear word!) But it’s just not our design style and we are staying in this house long term. So, I want something I can live with. I think I’ll give it a try. Benjamin Moore here I come. Good Luck with the rest of your painting!!! hey! i spent my weekend painting also! Yours is looking much better than my front doors tho. Supposed to be fig green and turned out harvest gold, yecchh… good thing i’ve got a gallon of the fioli yew (olive drab) that i painted the washroom base cabinets in left over, have a feeling those bright yellow doors will end up olive drab in the end. I totally agree with Kelsey. I think you should paint above the molding/ceiling. A color that will compliment the wallpaper would look lovely! Yippee for you! This looks great. I’m sure the task is daunting (and difficult for a pregnant lady!). I spent the weekend cleaning our vinyl shower curtain liner and replacing the cloth shower curtain — quite boring in comparison to your project. What did I spend the three day weekend?! My husband and I created a compost area! I think that this was a great project in honor of Labor Day- working smarter. Reusing, reducing, and recycling! I am glad you decided to paint the modeling. It really has brought out each room! I also love the suggestion from Kelsey! Btw, I have the same step stool! Love that thing! It already looks amazing. Well done. We spent our whole weekend priming (which has to be one of the most ungratifying tasks!). Quick question – we have one window that we’re painting white and I had a little trouble getting the primer to go on smoothly. I used a cut-in brush and small cigar roller but there are so many right angles and corners that the primer had a tendency to pool or build up in areas. Any tips? Even though I am a huge fan of unpainted wood and loved your room before – this new look is brigher. WOW!!!! It already looks SO MUCH better! I was in Paris! 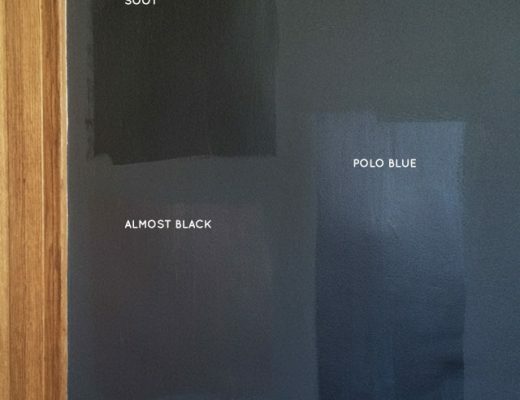 Are you going to paint the back of the cupboard a contrasting colour? I love how the white is looking with the wallpaper so far. Did no home projects whatsoever. Celebrated my 40th birthday instead! Painting looks great. Can’t wait to see it all done. BTW, can you tell me about that beautiful chandelier? I. Love. IT! As I always say, three day weekends are perfect for painting! awesome! can’t wait for the final result! How about painting the ceiling pink and the top part of the wall another color than white!! Really? Think of all the happy sunlight that will be bouncing around. Cheer up! Does laundry count? I did that yesterday after hanging out with my husband’s parents for the weekend. I love the painted wood I think it helps the pink of the paper really shine. Ah, what a relief. So much lighter and nicer. Hope it’s not all too tiring with Baby 2 The Sequel on board. Though do I remember going on several DIY benders during my pregnancies. Can I just say I like your wallpaper so much more!! Before it always felt like it was competing for attention from the wood..
Hi there! I just discovered your blog a few weeks ago, and I love it. I think you’ve made a great decision to paint the trim in your home…it really makes the space so much brighter! I also love that you used wallpaper in your home. I feel like there aren’t that many people who are brave enough to use it. Great job! Oh! It’s looking wonderful! The white trim really is freshening up the room, and I think it is going to make your current dining set feel much lighter! I love it already! I’m so glad you posted a picture, I couldn’t wait to see the results. Ooh, it’s looking fantastic already :) Way to be brave and go for it! While I would have reconsidered the wallpaper choice before painting the woodwork (something more like the handprinted choices offered by Bradbury), it will be interesting to see how this comes out. It does look brighter but also less distinctive, I think. This looks like a lot of work, but it will look so beautiful. I prefer the look of white trim and saw that some comments encouraged you to rethink your project. I’m all for it! I am looking forward to seeing the finished product. HUGE difference. Really brightens up the space! Love it. 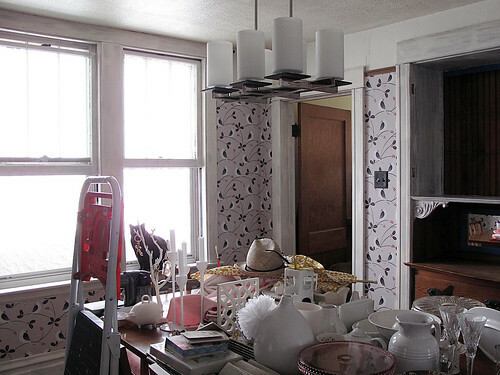 Wow it looks like a totally different room – cannot wait to see what it looks like when its all said and done! It looks like a newer house, for sure. Last weekend, I shopped till I dropped. Labor weekend sales are dangerous for the wallet AND my knees. I LOVE your wallpaper! where did you get it? WOW! It already looks amazing. Way to go Mama. Your 30 before Thirty list is so very inspiring… Might have to make my own! Off to a great start! Do you have to do any wood prep other than priming? Our crown molding is wood and I’m thinking of painting it white too. re. our Labour Day : crossing every finger and toe while our house was inspected! It already looks great! It really brightens up the room and even makes the wallpaper look lighter. oooo, this is exciting, can’t wait to see how it all turns out. I repainted ALL the trim in our house when we moved in (it was painted icky beige) and it was exciting watching the change. First the primer (some improvement) then the first coat of the white semi gloss (better) then the next coat (nicer, better smoother, PRETTIER!). Oh, I like it already, even though it is just a coat of primer, it looks so much fresher. SO much better white!!! Better and brighter! I bet it’s gonna look great and I’m gawking at all of your white accessories. I have a thing for them now. 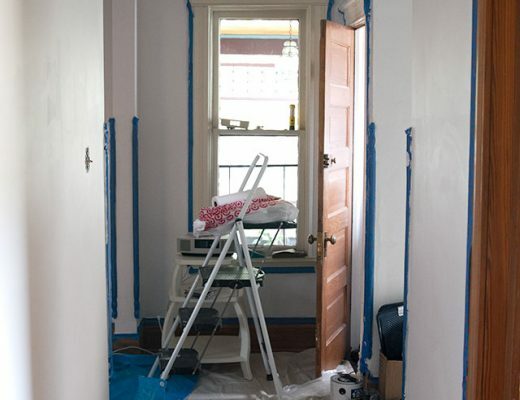 Painting is a perfect Labor Day project. It looks so bright and cheery already! I spent my weekend having a fantastic 1st birthday party for our son! I’m blown away at the amount of comments you got for painting your trim, it’s like the debate stay at home mom or go to work mom right!! I’ve lived in old homes most of my life and have always painted the trim white and for the same reason you did, the idea of wood is great but the homes most of us live in doesn’t have flawless beautiful wood and over time it just looks old and dirty. The white trim looks great and really brightens the space up! It looks pretty and bright already! Looking at the pile of stuff on your table – you have such lovely things! It’s already looking FABULOUS! Keep it going lady! it already looks “fresher” and cleaner somehow, looking forward to seeing the final outcome! It does look so much brighter. Can’t wait to compare before and after pics…I want to paint our trim and my husband doesn’t. I’m hoping this will help convince him. I would love to see a HOW TO post, as this is exactly what my husband and I are looking to do in our home. I love your statement about this being your home and not a time capsule! p.s. our wood trim is a total monet as well! !